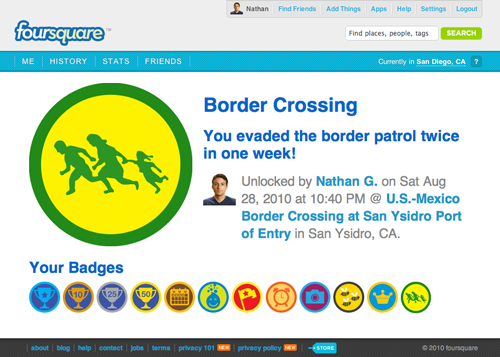 When I started using Foursquare, there were no border crossing venues. I added locations at both the San Ysidro and Otay Mesa ports of entry. 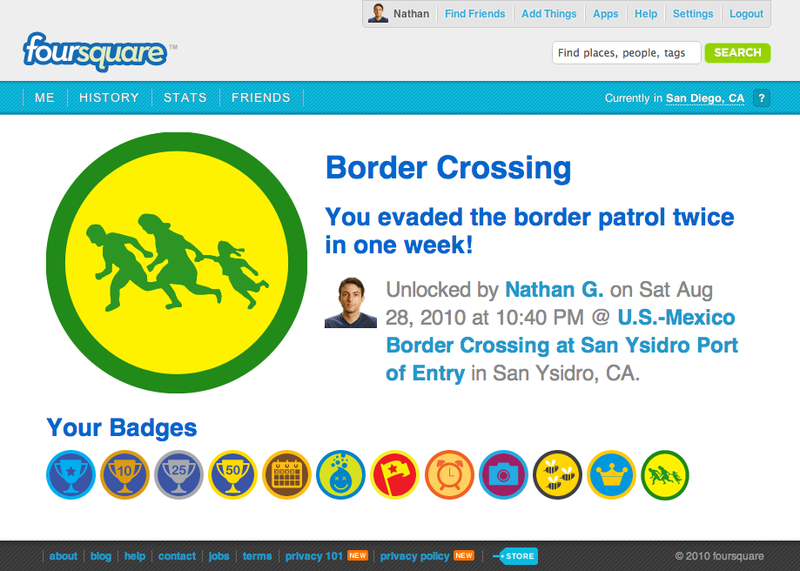 But soon after, I was ousted by more frequent crossers who joined Foursquare. The border is a complicated place in terms of politics, culture, economics, language and cell signals. It should be no surprise that Foursquare check-ins are also messy. There’s no address at the international line between the U.S. and Mexico. There is an address for the customs office, but that location doesn’t jive with GPS data when people wait in line to cross. In this confusion, people have added a number of redundant venues. There are currently two with nearly identical check-in totals (at the moment). The venue containing “San Ysidro Port of Entry” in the title has twice as many check-ins per person as does the generic “US/Mexican Border.” I suspect it’s a case of locals vs tourists. I guess we’ll have to wait and see which venue becomes the dominant choice for border check-ins. It looks like Foursquare updated their database and combined the top two venues. If you click either of the two links above “US/Mexican Border” or “U.S.-Mexico Border Crossing at San Ysidro Port of Entry” you’ll see they take you to the same venue. At the moment, this consolidated venue has had 468 people check in a total of 1112 times. Ah yes, that mayorship went back and forth between you, Dr Chuy and myself for a bit there. I’ve been on the road so much I’ve no hope of getting back that mayorship anytime soon – but I’m really looking forward to that badge!! !